All boats have their advantages and limitations. A McLay 530 Fisherman. Before buying your first boat there is a lot to consider. Which boat should I purchase? This old question is similar to that other old question about, “how long is a piece of string?”The answer of course “is that it all depends!” New Zealand is an angler’s paradise. From high country lakes to rivers and the sea, angling opportunities abound. Even a modest craft will open up many new angling horizons for the budding boat owner. But back to our question about which boat to purchase. Firstly your decision will depend on the sort of fishing you have in mind. But let’s look a little deeper and hopefully pass on a few insights along the way. To begin with, there is no such thing a perfect fishing rod and reel combo that is ideal for all types of fishing. It is the same with boats. They all have certain advantages and certain limitations. Jet boats, for example, can operate in shallow water but they can easily become stuck fast in shallow water with a sandy bottom and are not much use for other forms of fishing. Though they can be pressed into service as a lake boat when needed a jet unit is far less efficient than a propeller. You have to first decide the sort of boat you would get the most use from and one that best suits the fishing you enjoy. This is a decision not solely based on money. To some extent, I think your buying decision should be influenced by where you live. If you really enjoy salmon and trout fishing and have a holiday-retirement home at South Rakaia Huts I guess it would make more sense to buy a jet boat. On the other hand, if you lived at Goose Bay, near Kaikoura you might be better off with a little 430 Stabi-Craft that would be small enough for you to launch down the wooden slipway at Boat Harbour. This would save you having to drive to the big concrete slipway at South Bay for launching and would be ideal for lifting a few craypots and catching a feed of blue cod and sea perch while providing a reasonable level of safety when the water gets choppy. Before buying your first boat consider which craft will return the most use and enjoyment for your hard earned dollars. Many a boat buyer has purchased a larger vessel than they really needed only to find it a big hassle to connect the trailer coupling, tow it to the water, launch and retrieve it, and so on. Let’s say that most of all you enjoy trolling on lakes for trout and landlocked salmon. 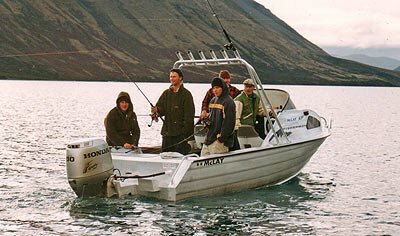 You enjoy fishing in various lakes in Central Otago, Canterbury or Taupo. This would account for 90 percent of your fishing no matter which boat you owned. But at the same time you would like to do a bit of inshore sea fishing, and perhaps occasionally venture a bit further out after tuna or perhaps a groper. My advice is to get a boat around 5-6 metres that is light and easy to tow. Set it up for Lake trolling. You will also be able to use it in sheltered coastal waters. On the odd occasion when you want to venture out deeper leave your boat at home and book a charter instead. This is what I do. That way you travel to the offshore fishing grounds in style and comfort. Most importantly all your fishing will take place in purpose designed vessels! Some boaties make the mistake of buying a big trailer boat that gets very little use for just this reason. It is so big and awkward to tow anywhere they just can’t be bothered! Such a boat will be very expensive to insure, maintain, and costly to run. It will also be a handful to launch and retrieve unless there is a solid concrete slipway available. If you are after “bigger fish to fry” offshore, then you are going to want something a bit more substantial like a 20 footer or bigger. This option will cost a good deal more because a bigger boat means a bigger motor and trailer. It usually also means you’ll want a more powerful and heavier vehicle to tow it. Fitting out a bigger offshore vessel will also be more expensive. Moorings are also expensive, and as has been the experience with the failed Lyttelton mariner, not that secure either. Further up the scale a hardtop on a trailer would be even better. Just great for overnighting in the Marlborough Sounds, and on the big southern lakes – plus no mooring fees. The southern lakes are not to be taken lightly. They can cut up very rough when the wind blows and are no place for small boats. It is a good idea to go out in a boat similar to the one you are considering purchasing. Ask the owner what he likes and dislikes about it. Try to go out in at least several different makes and types of boat as well. Different makes have certain advantages and disadvantages. In particular, some have a great deal more use-able cockpit floor space than others of a similar length. Look for the features that you would find most useful for the sort of fishing you do most often. I remember years ago going from a 430 Stabi-Craft (4.3m) to a larger McLay 530 Fisherman (5.3m). The McLay was just a metre longer but was quite a bit wider. However, the difference between them when it came to cockpit size was immense! The Mclay cockpit was massive in comparison. I remember walking around the cockpit of the Mclay while talking on the cell phone. Something you couldn’t do in the little Stabi-Craft. In the McLay, we would often fish standing up while in the Stabi it was better to sit down. On the other hand, the Stabi-Craft 430 was easier to tow and could be launched from just about anywhere! The McLay 530 felt far bigger and safer, particularly when used for sea fishing. My advice is to get out on the water in a few different boats if you can. Each has a quite different feel to it. You may discover that a slightly larger boat, or a different model, has a lot more fishing room than you thought it would. A boat doesn’t have to be big and expensive either. Many an angler/boatie has started out with a humble tinnie. So long as you understand and accept their limitations these versatile aluminium boats can be tremendous fun. Fishing is a great leveller. Having the best and biggest boat will not make you a better fisherman. Fishing competitions are often won by the bloke with the cheapest boat in the fleet! you can carry a tinnie on the roof of a vehicle though a small trailer I find is much easier. It is possible to drag a tinnie over land for short distances when launching and retrieving which makes them versatile fishing craft. You still need to be safety conscious with these small alloy boats and kayaks. Always wear a life jacket, don’t fish alone, tell someone where you are going, and don’t go out when the weather is cold and rough. It is much safer when fishing from small boats to stay close to the shoreline when sea and lake fishing. If the wind suddenly gets up head for shore straight away! A sit on top kayak designed for fishing may suit your style of fishing better. You can carry it on the roof of your car or 4×4 and it will be a whole lot cheaper to purchase and set up than a trailer boat. On many Canterbury high country lakes, motor boats are not permitted. Many of these are smaller trout fishing lakes well suited to kayak fishing. The kayak provides excellent access and increases your chances of catching fish considerably. Lakes such as Clearwater, Heron, Selfe, Lyndon, Pearson and others are magical places to fish while leisurely paddling and drifting in a kayak. You will be able to fish areas around the lake that would otherwise only be accessible after a very long walk. With a kayak you can also use small electronic fish finders, harl a flyline, drift while spin fishing, or troll a lure. When you do buy your first boat: take it easy to begin with. Try to work your way up by beginning with a less ambitious trip first. The worst thing an inexperienced boat owner can do is head ten miles out to sea in the thing the same day he takes delivery of it. Many have perished making just this mistake. Joining a fishing or boating club is a good idea. As is asking someone with experience to accompany you on your first couple of outings. When sea fishing fill out a Two Minute Form and hand it into the Coast Guard. If you don’t return on time they will come looking for you. Here are a few tips to keep you out of trouble on those first few adventures out on the water. 1. Don’t attempt to power your boat up on to the trailer at the slipway. The slightest misjudgment can easily result in costly damage. Instead, toss someone a line and guide your new pride and joy onto the trailer. Hook the winch hook on to the bow early and winch it onto the trailer. Don’t be afraid to get wet feet if you have to. 2. Don’t be afraid to ask for help if you are uncertain. Everyone was a new chum once! 3. Don’t let other impatient slipway users rattle you. For this reason, it might be a good idea to go for a few initial short runs on weekdays rather than on busy weekends. 4. Before you launch run through a checklist as you load your gear into the boat. It is easy to forget something even for an experienced boatie. Your checklist should include: are the bungs in and tight? What about flares, fire extinguisher, anchor, marine radio, lifejackets, bailer, spare fuel, something to eat and drink, warm clothing, and so on? It is very easy to get underway and then realise you have left something important back in your vehicle at the slipway! I remember years ago being involved with the running of a big fishing contest. This “contestant” backed his boat down the crowded launching ramp towards us. He climbed down from his expensive 4WD vehicle and began un-doing his locking chain at the front of his trailer. We couldn’t stop grinning! “I don’t think you’ll be going far today,” my mate said. “Why is that,” replied the indignant contestant. “You have no propeller on your stern leg,” my mate replied. The contestant walked briskly to the rear of his pride and joy to see for himself. Sure enough, he had forgotten to reattach it the night before. Red-faced he climbed back into his vehicle and drove away! One wonders if he could forget to reattach the prop, what else might he have forgotten! 5. Always have a backup device or a backup plan. For example, carry three times as much fuel as you think you will need to get there and back. Have two means of propulsion such as the main motor and an auxiliary motor. Have a marine two-way radio and a cell phone. A marine two-way radio is much more important in an emergency situation than a cell phone as it will be heard by the coastguard and other vessels in the immediate area. Use a cell phone only if you have nothing else available. Have two bailers instead of one, and so on. Consider having a “Ditch Kit” in a handy spot on your boat. This consists of a bag about the size of a rugby player’s gear bag. Fill at least one of the compartments with EVA foam so the bag won’t sink. In the bag, you have a radio, inflatable life jackets, “orange sausages” (large sausage-shaped orange plastic bags over a metre in length carried by divers as a safety device). They are inflated by holding them into the wind and then tying the other end and are used so searches can see you in the water. You also would include flares, bottles of drinking water, chocolate bars, and such like. Should your boat sink suddenly and you and the crew have no time to think you just grab the bag and jump overboard! 6. Avoid trouble by not taking risks in the first place. Count on yourself to get yourself out of trouble, rather than relying on a marine radio or cell phone and calling on someone else to come and rescue you. However, if you do get into serious trouble don’t hesitate to call for help immediately. 7. If the weather is a bit rough be brave enough to tell the kids that you are not taking the boat out. Even if you have towed it all the way from Christchurch to Lake Coleridge. When it’s your boat you are the skipper – what the skipper says goes! If the weather is looking a bit dodgy don’t go out. Listen to the weather forecast regularly and learn to judge the weather for yourself. Keep a constant eye on wind speed and direction. If conditions worsen head back immediately. Don’t try to hang on until the sea conditions become boarder-line. When fishing on a large lake from a small craft hug the shoreline. Avoid heading out into the middle of the lake. Should the wind change suddenly lakes can, and do, become very rough, very quickly. Most boating accidents are avoidable. Many result from an unhappy combination of factors coming together at a certain time and place. Individually these factors wouldn’t be too bad, but when stacked one on top of the other disaster can be closer than you think. For example, you are a couple of miles off Kaikoura. The sea was a bit rough and choppy when you set out. But the wind has increased and it is starting to rain. One of the crew is feeling a bit sick, so you decide to “up lines” and call it a day. Only problem though is the dam motor won’t start. You have no auxiliary – when the sea is rough and the wind strong, a small auxiliary won’t be a lot of use anyway. The sea is very deep off Kaikoura making your anchor useless. You will, of course, be drifting with the wind. Already the situation has started to become life-threatening. You decide the best option is to sort the motor out. You suspect it is a fuel problem and begin a check of the fuel lines (sometimes a fuel line can pop off the motor un-noticed – the majority of engine breakdowns are in some way fuel related). However, without power, or a drogue, your boat will drift with the speed of the wind taking you far from your present position in a short space of time. If blown inshore you are likely to be smashed on the rocks; blown offshore with few provisions in a worsening sea isn’t a much better prospect either. If you can’t get your motor started quickly your only option is to try to signal for help by radio, flare, and/or cell phone. If venturing offshore it is a better option to travel out together with at least one other boat. This buddy system would enable your mate to tow you back in this situation. There are still other factors that contribute to such “disasters in the making.” Such things as a less than seaworthy boat, no radio, lifejackets, bailer, flares and drinking alcohol can speed the pace of events. The Coastguard reports an astonishing number of boaties who get into difficulties as a simple result of underestimating their fuel requirements. Don’t go out in your boat late in the day. Any problems are only going to be made far worse by rapidly approaching darkness. 8. Buy a copy of “The Boat Code – The Rules of the Road at Sea” by Penny Whiting, and study it up before you even purchase a boat. 9. Better still; enrol for a “Day Skippers” course with the Coastguard. First-time boaties have heaps to learn. Much of it is alien to someone who has had little to do with boats. I am amazed at the number of boaties I pass in the Kaiapoi River who seem unaware that they are supposed to pass other vessels port side to port side. This is the opposite of the road rules in New Zealand where we are taught to “keep left” from an early age. When driving a car if you switch the motor off and pull over to the side of the road the car won’t move at all. This is not the case with a boat on the water. A boat, unlike a car, will keep on moving with the wind and tide until it either runs aground or capsizes and sinks. This could take a few minutes to many months to occur. It is vital to keep a constant lookout while out in your boat in order to avoid a collision. It seems obvious but yachts, in particular, collide with one another quite often. I once had an office next to a yacht builder. One day we talked as he was doing repair work on a sailing dinghy that had been almost cut in two by another bigger yacht running over it out on Lyttelton Harbour! Boats often have blind spots. You would think that on the huge ocean, or a lake, those collisions would be unlikely but they happen and are caused by failure to keep a constant lookout. Reliance on modern electronics is also a trap. The autopilot won’t stop you running over a jet skier or a diver! Buying your first boat is a big step. Safety considerations should always come first. At the very least try to go out with someone who owns the same type of boat you are thinking of purchasing. Talk to them about what they like and don’t like about it. Sometimes you can have a mate who likes a particular type, make or size of the craft. That mate may be blinded to other options out there. A couple of extra feet in width and length can be quite a lot when talking boats. You might be pleasantly surprised at just how much more roomy a different option could be. You need to walk around in the cockpit to get a proper feel for the size. When buying your first boat it pays to have a really good look around at what is available in your price range before you commit. Inflatable Boat – Is it any good for fishing?